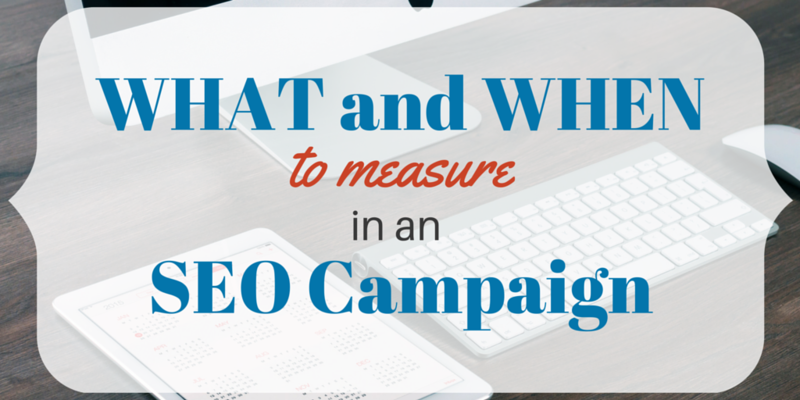 There’s no shortage of metrics to measure in an SEO campaign. With the goal of getting more traffic to your site by building a reputation, improving the structure of your site, and producing great content, you need to know everything – from which posts of yours are performing best to how many actual customers are coming to your site – to get a true grasp on how “valuable” or “successful” your strategy is. The problem is, this sheer number of possible metrics is overwhelming, and if you measure them at the wrong pace, you may come to an inaccurate conclusion (for example, if you see your organic traffic drop one day, it’s not necessarily an indication of a seriously threatening long-term trend). To make things a little easier, I’ve compiled some recommendations for which metrics you should measure, and whether you should measure them daily, weekly, monthly, or annually. Please note that this list is not comprehensive – there are a number of other factors, statistics, and behaviors you should be measuring in the background to be thorough in your campaign – instead, this list was designed to showcase some of the most important metrics, and at what intervals they should be measured to avoid coming to any erroneous conclusions. There aren’t many metrics you should be checking daily. Daily fluctuations, sometimes volatile, are a fact of SEO, and looking up daily statistics will likely drive you crazy. Still, there are a couple things you should check on just to make sure things are running smoothly. First, do a check of your site. Log into Google Search Console and look for any problems with your site uptime, crawl errors, hack warnings, or other errors that have popped up since the last time you logged in. Such errors will likely be rare, but when they do happen, you’ll want to catch them fast and take action. It’s also worth poking your into Google Analytics and checking out the Acquisition area. Here, you’ll see a breakdown of channel-specific traffic that’s coming to your site (including direct, referral, organic, and social traffic). Don’t get too excited or worried about the actual numbers you see here. Instead, you’re only looking for abnormal spikes you could take advantage of. For example, if you see a major spike in social visits, it means your social followers are particularly active today, and you can move in to take advantage of it. Organic traffic is the most direct way to measure your progress in an SEO campaign. More organic traffic means more search visitors are coming to your site, which means your strategy is becoming more successful. Measuring this weekly is spaced out enough to help you avoid misleading volatile information, but also treat this information with a degree of caution. You’ll be measuring this monthly and annually as well, so if you see an outlier, take note of it and see if your broader measurements confirm the new trend. It’s also a good idea to measure your conversions weekly, especially if you’re in the habit of making tweaks and refinements to your site or landing page. This is a perfect opportunity to see if those changes had any effects. However, if your traffic or conversion rates are exceptionally low, a week may not be enough to measure a significant difference—if this is the case, save it for a monthly analysis until your traffic numbers rise. “Social signals” is a blanket term referring to social media shares and engagements with your brand. Greater social signals are correlated with higher search engine rankings, so use these to evaluate your social performance. It’s best to measure these weekly, as trends change quickly in social media – find out what topics and what types of posts are working, and try to improve upon those. Comparing one month’s organic traffic and conversions against the previous month should give you a much more accurate picture of your progress. This is especially useful if you compare several of them in a row. If you notice your traffic isn’t increasing, it could be a sign of a stagnated campaign. If you notice your conversions are low, your site likely needs further optimization. Bounce rates don’t have the power to make or break your campaign, but they can be improved. If you notice a certain page faring worse than the others over the course of a month, take note of it and try to find ways to improve its function or aesthetics. End of month is also a good time to look at the individual pages of your site, particularly your blog and content pages, and see which ones are performing best. Which topics are people most interested in? What’s getting you the most traction? Use that information to inform your content strategy moving forward. It’s also important to glance at your link profile, using a tool like Moz’s Open Site Explorer, at least once a month. You’ll want to see where your links are coming from and which specific pages they’re pointing to – are there any knockout content hits on your site that are attracting tons of links? Are there any bad links that have shown up that need to be removed? It’s also a good time to take a look at how many leads you got through the site and how many of those leads actually closed. If you calculate the average customer value to your business, you can then calculate the average value per lead. With the average value per lead and organic traffic conversions calculated, you can come up with a ballpark figure for your campaign’s ROI. As this is a monthly measure at this point, try not to use it as the ultimate determinant for your campaign’s success – instead, use it as a guiding figure to help you understand where you stand. You’ll be measuring your traffic and conversions year-over-year just as you measured them month-over-month. Here, you should see a crystal clear picture of how successful your previous year’s efforts have been. With an annual measure of your organic traffic, conversions, and total campaign costs, you should be able to calculate a fair ROI for your campaign. Free from any volatility or strange disruptions, this should provide you an accurate picture of whether the campaign was worth your while. Your first year might be shaky, but every year thereafter should be squarely in the positive. SEO is a long-term campaign, so you have to be patient when measuring its results. Only after several months will you have an accurate picture of your traffic’s growth, and only after a year will you have a stable, reliable figure for your strategy’s ROI (as you’ll likely see volatility as you measure it monthly). As you might expect, it’s not essential for you to stick to this list exactly – different businesses will have different needs and different patterns of user behavior – but using this as a loose guide, you should be able to temper your expectations and come up with far more accurate, better-informed conclusions. Thanks Jason, definitely some key metrics in here. I would however suggest that year over year performance be viewed on a monthly basis, so you can get a clear view on Year To Date (YTD) which allows you to factor in seasonality to your analysis. Often if you see a drop or spike when looking at MoM, even over several months it can set alarm bells ringing or give a false positive, but more often than not it can be attributed to a seasonal trend that is encountered every year, so looking at this on a monthly basis can avoid internal and client panic / overpowering joy on performance where it may not be merited. Which AWR reports generate the info you’ve recommended? For Site Staus and information related to site crawls, you need to go to Playground > Auditor and schedule daily site scans for your website. The Organic Traffic, as well as the traffic coming from all the other sources, is accessible from Rankings > Overview > the Analytics tab. You will also find there information about your site conversions. Just play with the selections and you will get all sorts of insights from there. You can return to this data daily, weekely, or as often as you need. The Social menu presents the global evolution of your social audience. For page level social metrics, you need to switch to Research > Organic > Top Pages tab. From there you can asses the performance of Individual Pages from your website, as well as your competitors’, using multiple metrics, not just social signals. Similarly, from Research > Paid > Top Pages tab, you can evaluate the performance of your site pages in Paid campaigns. Unfortunately you cannot complete the list of measurements recommended by Jayson using AWR Cloud, as at this moment, you won’t find in AWR Cloud information about Bounce Rate, the calculation of your Customer Value and consequently neither of your ROI.